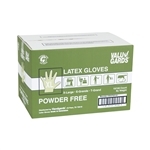 Disposable latex gloves are items that should be readily at hand in every business. Commonly known as surgical gloves, the wholesale latex gloves on offer here are not sterilized as are true surgical gloves, but they offer the same protection against chemicals, bacteria, viruses and, most importantly, coming in contact with blood that may be contaminated. Here you'll find both powdered latex gloves and powder-free latex gloves, lined and unlined. 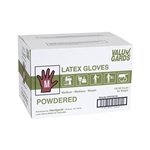 General purpose latex gloves come in all sizes, from small to XL, and are available in wholesale quantities of up to 1000 per case at high-value prices. 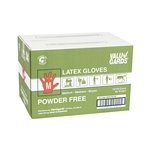 Food service latex gloves are recommend to prevent contamination of food from workers' hands. We also carry flock lined gloves that are easy to put on and remove and are more puncture resistant. Handgards Latex Medium Glove Yellow - 12 in. 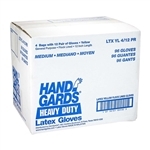 Handgards Latex Large Glove Yellow - 12 in. Disposable safety latex gloves are critical to many businesses including healthcare, so trust us for your latex glove products. 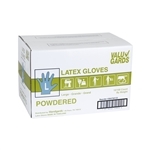 Latex gloves are ideal for foodservice use, housekeeping, industrial clean rooms, and assembly areas. They provide a snug comfortable fit, improving dexterity and touch sensitivity, and are recommended for delicate work, such as, slicing or chopping. 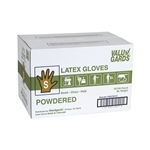 Latex is available in powdered or powder free.